This page used to begin: "Anyone travelling in Scotland will pass through Crianlarich sooner rather than later as it lies at the junction of two of the main routes from the lowlands to the north west highlands." In December 2014 a bypass was opened linking the A82 south of the village to the A85 to its west. It nonetheless remains a busy place. The name Crianlarich comes from the Gaelic for low pass. In the 1750s two military roads met here. 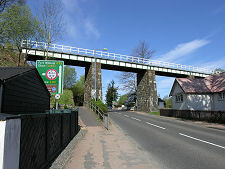 One came from Stirling via Callander and approached Crianlarich from the east along Glen Dochart. The other started in Dumbarton and approached from the south along the banks of Loch Lomond and Glen Falloch. 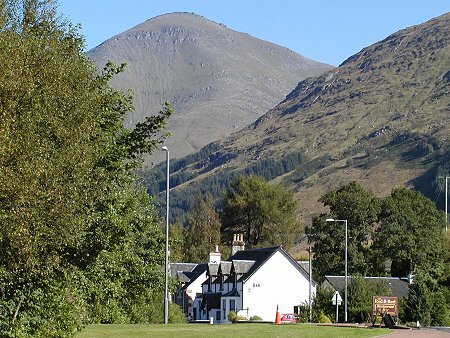 Having met in what became Crianlarich, they proceeded north west along Strath Fillan to Tyndrum before splitting again to head north towards Fort William and west towards Oban. This pattern is matched today by the A85 and A82 roads, following almost exactly the same lines as the old military routes. And in the 1800s similar lines were followed by the railway builders. 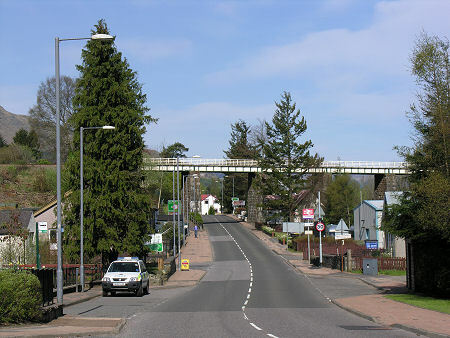 The first railway to arrive in Crianlarich was the Callander and Oban Railway in 1873. 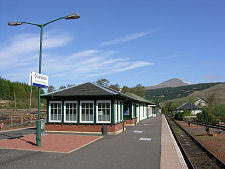 In 1894 Crianlarich acquired a second railway station with the arrival of the West Highland Railway from Glasgow, en route to Fort William and Mallaig. The line from Callander to Crianlarich was due to be closed when in 1965 nature took a hand, and the closure was brought forward by a major landslide. Crianlarich is now the point at which trains from Glasgow to Oban part company with those bound for Fort William. 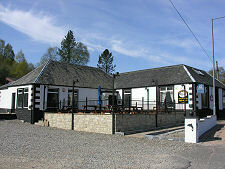 Since 1965 Crianlarich has been home to just the one railway station, recently refurbished, and complete with a tea room. 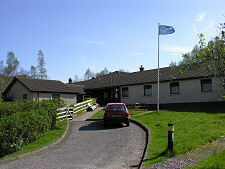 From here you can enjoy magnificent views of Cruach Ardrain and the other mountains to the south east of Crianlarich. Here, too, you can watch timber from nearby forests being loaded onto rail wagons for the journey to the paper mill. To bring the transport picture truly up to date, Crianlarich also serves as the crossroads to two long distance footpaths, one official the other not. The West Highland Way comes through the village en route to Fort William from Milngavie on the outskirts of Glasgow. Meanwhile the less well known Coast to Coast Walk calls in on its journey from Oban to St Andrews. Were it not for its transport connections, there would probably be very little to Crianlarich. 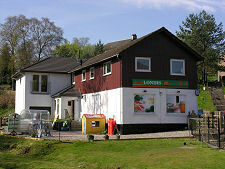 As it is, it remains an extremely small but busy village. 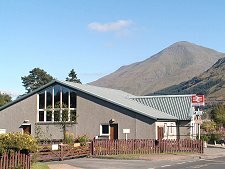 Accommodation is plentiful, ranging from the excellent Crianlarich Hotel in the very centre of the village to the large and modern Youth Hostel near the railway station. 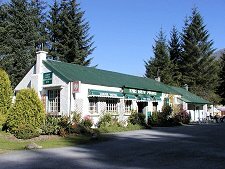 The options available include Guest Houses and B&Bs, campsites a few miles down Glen Dochart and in Tyndrum, and wooden wigwams for rent in Strath Fillan. 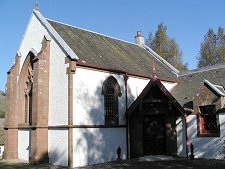 Crianlarich also offers a good shop and post office, an attractive little church, and the only police station for some distance in any direction. 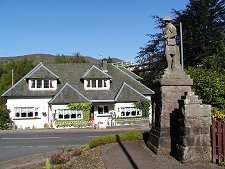 It is also convenient for those wanting to climb the mountains of Glen Falloch, or Ben More, which towers over the village to its east.